Among friends we often discuss the best five films ever or five albums to bring to a desert island. Of course we also discuss what would be the dish you would eat if you only could pick one to have everyday for the rest of your life. The last question is a tricky one. You need to find a dish that is tasty, but it should also be one that you could vary so that you are not bored til death after the first week. My pick so far is meat fondue. It’s delicious and variable. The choice of starter is much easier for me. There is one starter that never disappoints me, Löjrom (vendace roe). The best roe comes from the water outside the small town Kalix in the north of Sweden but the americans also produce vendace roe. The roe has a salty, light fishy taste and should be served with sour cream, chopped red onion, lemon and either a blini or a potato cake. I prefer the latter one. The Swedes are not the only fans of Löjrom. When the owner and star chef of El Bulli, Ferran Adrian, was asked to describe all players in Barcelona with a dish, he picked Löjrom to describe the new Swede Zlatan Ibrahimovic (At this point the Catalans had high thoughts of the Swede). If you have not yet tried this delicacy, this is one of the top reasons why you should pay Sweden a visit. Grate the potatoes, make for small thin cakes flavoured with salt and pepper. Fry in a buttered pan. 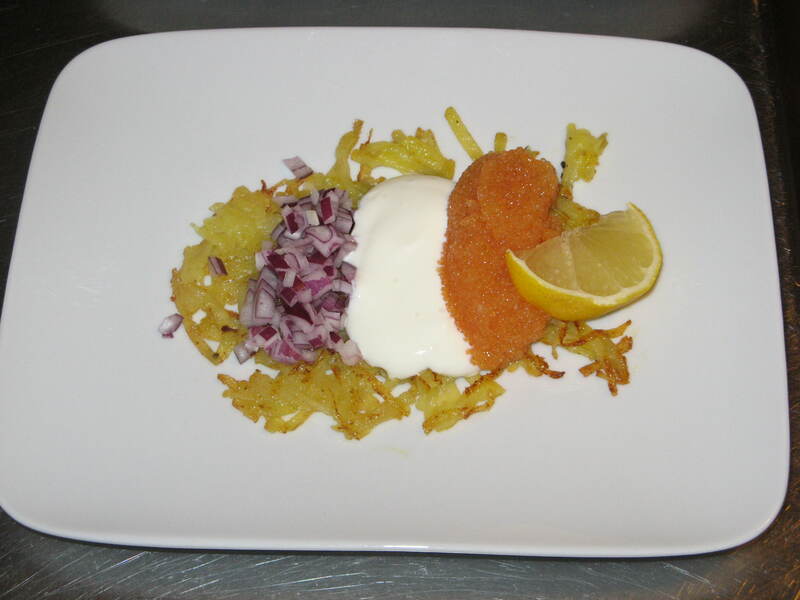 Serve the potato cake with sour creme, chopped red onion and Löjrom. Arrange with lemon. Serve with a beer and a snaps. Enjoy! We haven’t been that active at all on the blog the last couple of weeks. One reason is that we went to Sweden to celebrate Christmas and had lots to prepare. Each year we are having a traditional Swedish julbord (buffet), and you should fill up at least 10 different plates. My favorite is the herring and in my family, this is where we put our focus. This year we served eight different marinated herrings. Unfortunately we had too much snaps, so there were only very blurry photos. We’ll try again next year. When back in Berlin we were really tired of herring, ham, meatballs, etc and therefore payed our local butcher Filetstück a visit. 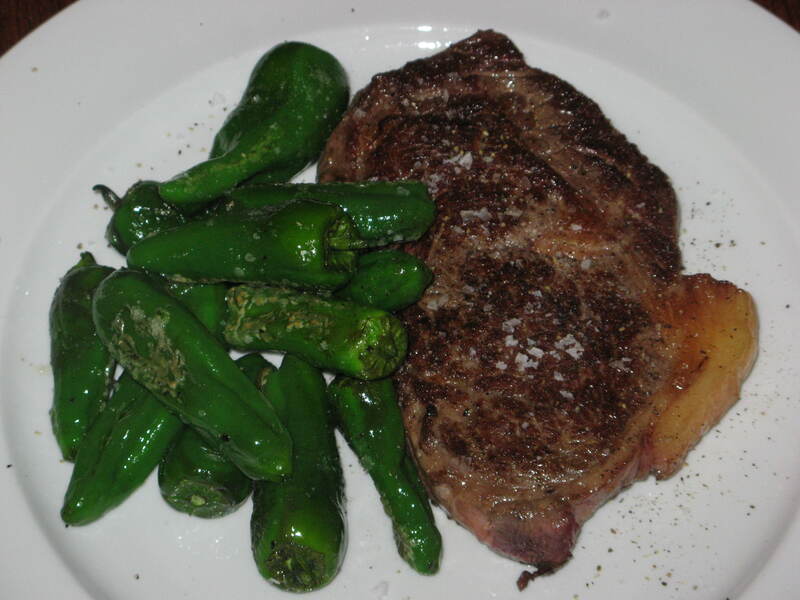 We bought two huge dry aged entrecôtes, wich we grilled and served with a handful of fried padrones, salt and pepper. So easy but so tasty! We promise to blog more actively in the future.